Bakersfield Truck Accident Injury Lawyer – Over 40 Years of Experience You Can Trust! Our Bakersfield truck accident lawyers offer expert personal injury legal services for those injured in a truck collision, especially crashes with big rigs and semi-trailer trucks. We also provide compassionate services for the families of those killed in a truck and other tragic accidents with wrongful death claims in the community of Bakersfield. Bakersfield is located near the southern top of the San Joaquin Valley, in Kern County, California. As per the 2010 U.S. Census, the city’s population was 347,483 while the total Bakersfield inner urban area including East Bakersfield and Rosedale had a population of about 464,000. The economy of Bakersfield is diverse and its industries include natural gas and other energy extraction, aerospace, mining, petroleum refining, manufacturing, distribution and food processing. 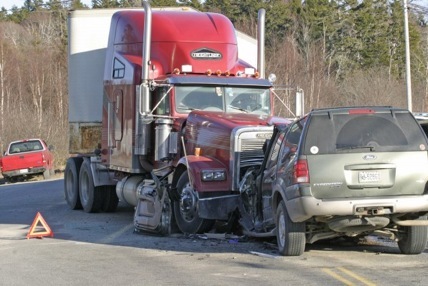 At the Walch Law Corporation, our personal injury lawyers understand how devastating a truck accident can be. Any truck collision in Bakersfield can lead to tragic outcomes and injuries from broken bones and fractures to serious head injuries and even sometimes resulting in wrongful death claims. The effects on the victims involved and their families are long lasting, especially the resulting emotional trauma. How to Prevent Truck Accidents? Commercial trucks are designed to carry heavy loads, such as heavy cargo and equipment. A truck weighs somewhere around 50,000 pounds while a car is often on average just about 1,000 to 2,000 pounds. Maneuvering a truck is sometimes very difficult, so truck drivers need proper training and should keep an extra space cushion when driving. Considering the potential for serious injuries that trucks may inflict, truck drivers must be extra cautious and take all measures necessary like carefully inspecting their trucks and cargo, especially their big rigs, before starting on the road to avoid any mishap. Restrict Distractions: Put away the cell phone, laptop nd other mobile devices while driving. They are all extremely dangerous when ones truck is in motion. Refrain from Alcohol or Drugs: Don’t drive under the influence of alcohol or drugs, as these intoxicating substances can affect ones ability to concentrate and react to changing road conditions or situations. Stay within Speed Limits: Excessive speed is one of the root causes of a truck collision. Truck drivers must drive slowly when approaching a turn or when the road is wet or icy. Check Your Blind Spots: When truck drivers change lanes, always look out for trucks and much smaller vehicles and motorcycles that may have pulled up alongside your truck. If you or a loved one has been injured in a truck accident in Bakersfield, or a family member killed and you have a wrongful death claim, it is important to learn about your legal right and options. Truck and transport companies have a team of insurance adjusters, investigators and lawyers who fight tooth-and-claw to curtail the cost of medical, rehabilitation services and other related health care expenses. You should try to even the playing field and contact our Bakersfield truck accident injury attorneys now. Our qualified and experienced Bakersfield truck accident lawyers have the required aggressiveness, compassion and understanding for our clients of personal injury cases. Entrust us with your personal injury and wrongful death claims to make this process easier for you and your family. Please contact our truck accident injury lawyers now for your absolutely FREE Consultation. You will be glad that you did! Why Choose The Walch Law Corporation? FREE consultation - NO fee until you win! Our truck accident personal injury law corporation has a long track record of upholding rights of injured victims and their families. Further, you can also visit our Truck Injury Accident Web Site to learn more about truck accident injury claims in detail. Feel free to call us for a FREE legal consultation with an experienced truck accident injury lawyer or any member of our legal team at 818-222-3400 (after hours, please press 1). You can also call us on our Toll-Free number at 866 INJURY 2 or 866-465-8792 (after hours, please press 1). You also may simply Contact Us at info@WalchLaw.com! We really look forward to hearing from you.